After a first league defeat of the season at Manchester City and an FA Cup exit at the hands of Wolves, Liverpool returned to winning ways with an important three points at Brighton. The Reds were not at their best against Chris Hughton’s increasingly well-organised outfit, but Mo Salah teased a naive challenge from Pascal Gross in the hosts’ box early in the second half and confidently drilled home the resulting penalty. 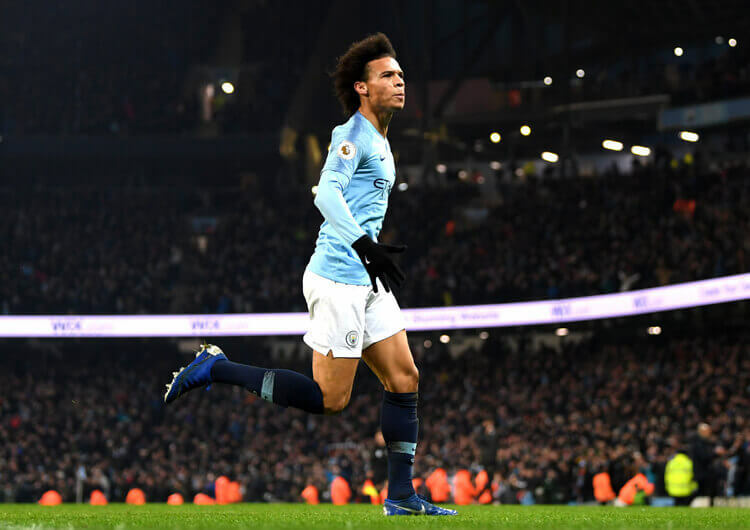 That proved enough to earn Jurgen Klopp’s side the victory and at least temporarily increase their lead at the top of the Premier League table to seven points. Brighton stay in 13th, still eight points clear of the relegation zone. Brighton registered only 32 per cent of possession across the 90 minutes, so spent most of the game in their out-of-possession structure, but when they did get the ball Chris Hughton set them up in a 4-3-3. 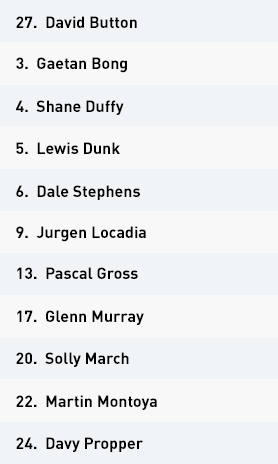 Dale Stephens, Davy Propper and Pascal Gross operated as a midfield three behind Solly March, Jurgen Locadia and central striker Glenn Murray. 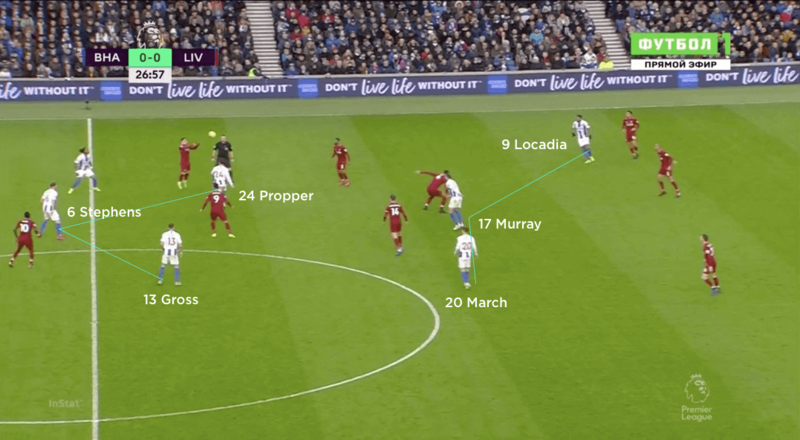 Locadia and March were always in the half-spaces during the Seagulls’ out-of-possession structure, so that they could burst forward into the space vacated by the Liverpool full-backs upon regain. Brighton’s strategies in possession were limited and mainly revolved around direct play to Murray, counter-attacks and crosses. Goalkeeper David Button regularly aimed for Murray with his goal-kicks, with Locadia and March looking for flick-ons while Stephens, Gross and Propper supported in order to compete for any second balls. When the Seagulls did see slightly more of the ball in the second half, they experimented with dropping Murray towards the ball and playing into his feet, which triggered the forward runs of March and Locadia beyond him. When they had good possession, they would look towards the half-spaces and wide areas and try to send crosses into the box for Murray and Locadia in particular to attack – but the hosts rarely threatened as Liverpool registered their 13th clean sheet from 22 league games this season. Out of possession, Brighton operated in a 4-5-1 mid-block structure with Locadia, Propper, Stephens, Gross and March across the midfield. They weren’t interested in closing Liverpool down until they passed the halfway line and would only mildly press even then, perhaps saving more intense pressure for when the ball went wide. Locadia positioned himself higher than the rest of the block and would occasionally look to join Murray on the top line – a gap in the block that Liverpool failed to exploit as they might have done. 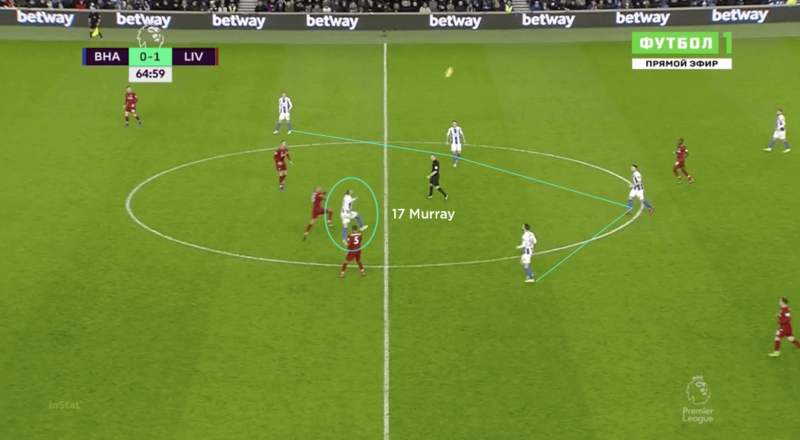 Murray would try to screen the passes into Jordan Henderson’s feet, but he was regularly outnumbered and did a lot of early running with no reward. As a result, he fell deeper and just tried to stay between Henderson and the ball. 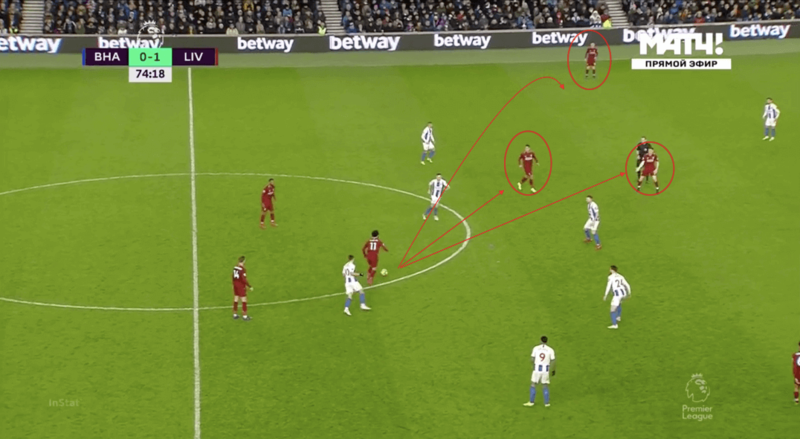 In wide areas, Brighton tried to double up; they found this easier when Mane was outside and Robertson came inside on the Liverpool left, although when the pair looked to combine through overlaps and underlaps, Gross would add a third defensive presence in the area. 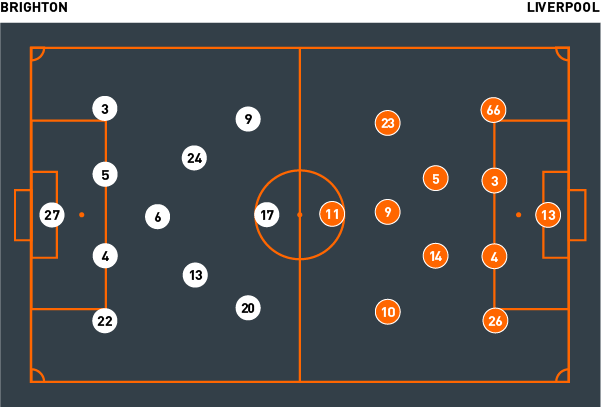 In truth, the hosts were mainly concerned with making the central areas as compact as possible and limiting spaces between the lines – this rarely went above 10 yards – when Liverpool had good possession in their half. 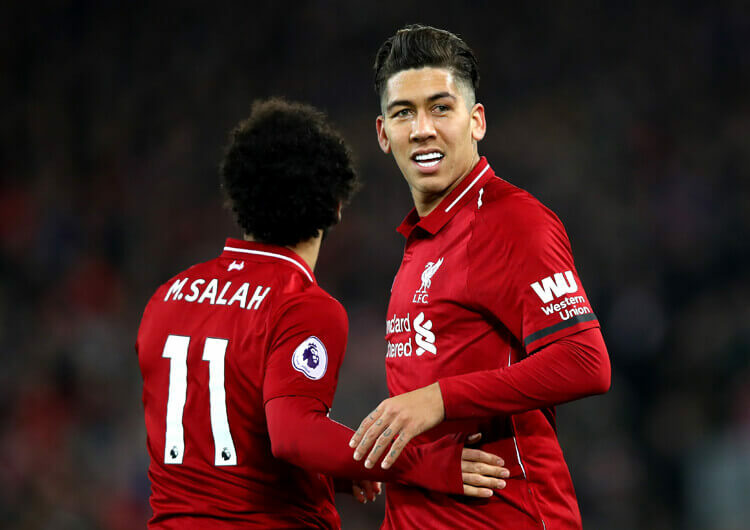 They were defensively sound for much of the contest, going down only to a penalty stupidly given away by Gross’ unwise tug on Mo Salah early in the second half. Brighton used a 4-3-3 formation in possession, with Jurgen Locadia, Glenn Murray and Solly March as the attacking trio. The hosts dropped into a highly compact 4-5-1 mid-low block out of possession, although Locadia often stepped slightly higher from the left side to support Murray. Chris Hughton’s men tried to use crosses from both the half-spaces – as here, from Pascal Gross – and wide areas as one method of attack. 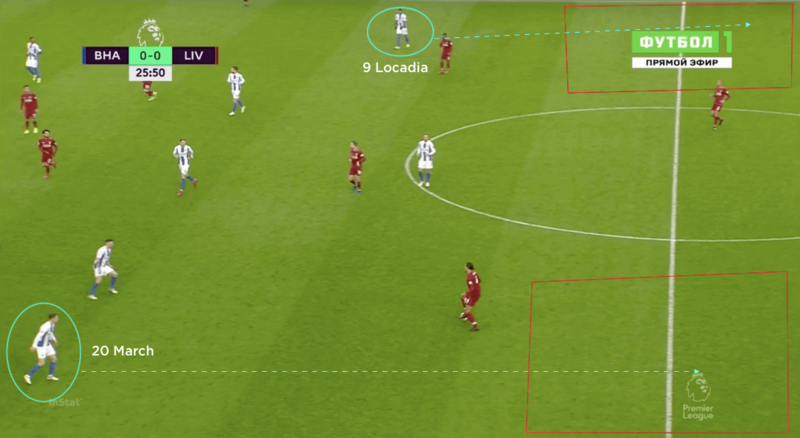 In their defensive mid-block, Locadia and March were positioned in areas that enabled them to exploit the space left by Liverpool’s full-backs in transition. Brighton mainly played direct to Murray, however, and would pack the surrounding area with players in a bid to win the second balls in advanced areas. Liverpool used a 4-2-3-1 formation in possession. Mo Salah, Roberto Firmino, Sadio Mane and Xherdan Shaqiri formed a fluid attacking quartet. The visitors pressed in the same 4-2-3-1 formation out of possession, with Salah usually leading the line. With 68 per cent possession, however, they spent very little time in this structure. The Reds used their attacking quartet and full-backs on different vertical lines to maximise their attacking width. This enabled them to stretch and create gaps in Brighton’s defensive block. Salah occasionally dropped deeper in the second half, so he could receive and run at the Brighton midfield. As opponents moved towards him, this opened up spaces between and outside the midfield unit. 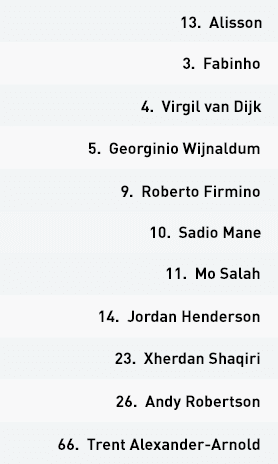 Jurgen Klopp set his Liverpool team up in a 4-2-3-1 formation, with Georginio Wijnaldum and Jordan Henderson starting as the deep-lying midfield pair behind a fluid front four of Xherdan Shaqiri, Sadio Mane, Roberto Firmino and Mo Salah. 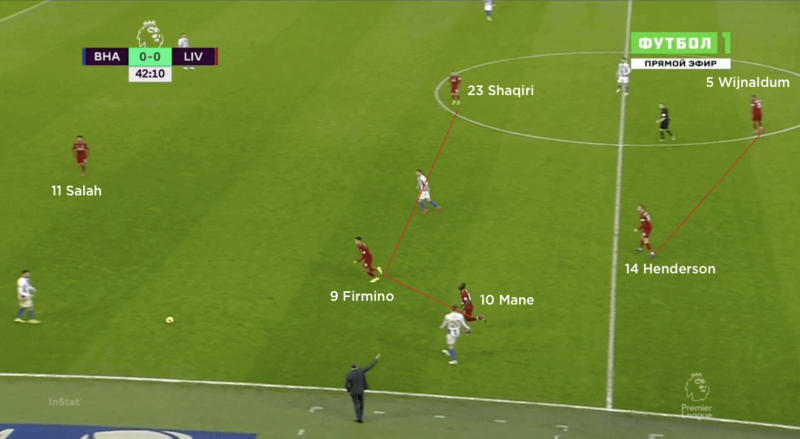 In the early stages, Liverpool tried to release Mane and Shaqiri in behind with aerial passes from deep, but the Brighton defence remained largely untroubled by this approach. Henderson and the centre-back pairing of Virgil van Dijk and Fabinho played patient, short passes between them in an attempt to entice Brighton out of their half and into a higher press – but the hosts were resolute in their defensive formation and rarely tempted to press. Instead, Van Dijk and Fabinho would travel out towards individuals within Brighton’s midfield unit, in order to isolate them and then combine around them. 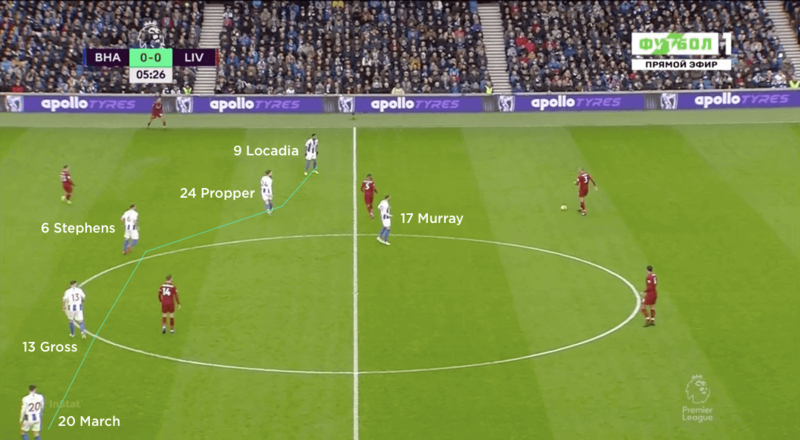 The Reds used full-backs Andy Robertson and Trent Alexander-Arnold, and the front four, on different vertical lines in order to provide full width and stretch the Brighton defensive unit, thus creating gaps inside for penetration or gaps outside to play around. 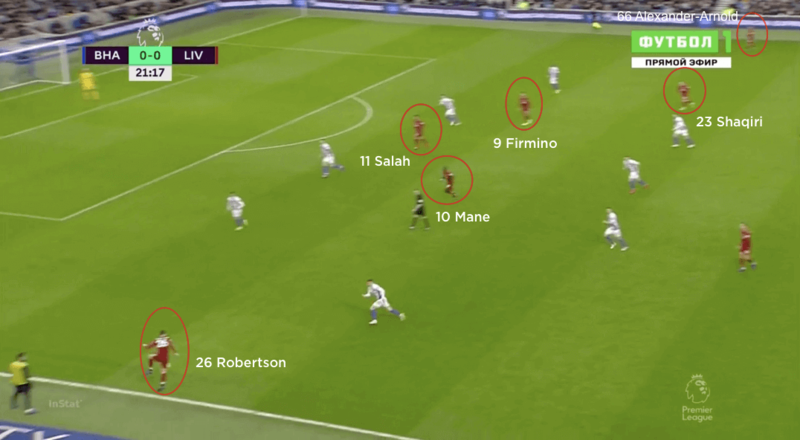 They also used passes into the feet of Shaqiri and Mane in the half-spaces, to draw Jurgen Locadia or Solly March into closing them down – this allowed for a set to Wijnaldum or Henderson, and then a pass out to Robertson or Alexander-Arnold in wide areas. 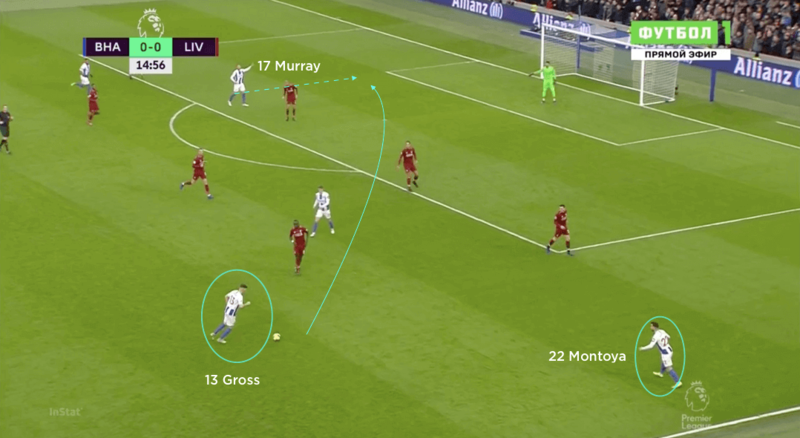 In the second half, Salah dropped much deeper to receive the ball off his central defenders in front of the Brighton midfield, from where he could drive at them. 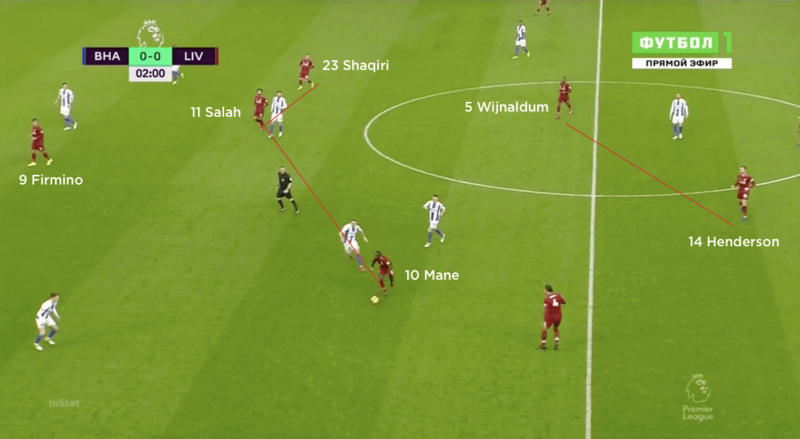 This forced the Brighton midfield into an even more compact shape; with opposition eyes on Salah and the ball, the Egyptian would look to play through these gaps or once again play outside to Robertson or Alexander-Arnold. Out of possession, Liverpool pressed in their 4-2-3-1 shape, with Salah leading the line. The forward’s job was to cut off one side of the pitch and rush the ball-carrier into early, inaccurate passes that Liverpool could regain from. In the event that the Liverpool front line was bypassed, or perhaps out of the game in a transitional moment, Wijnaldum and Henderson would look to shepherd the ball towards wide areas. Here, the midfielder would join with the recovering attacker and full-back on that flank to trap Brighton by the touchline. In truth, the visitors were never hugely troubled by the home side, and were happy enough from the moment Salah gave them the lead from the penalty spot early in the second half.